Bamboo is a web daemon that automatically configures HAProxy for web services deployed on Apache Mesos and Marathon. Since Marathon API and behaviour may change over time, especially in this early days. You should expect we aim to catch up those changes, improve design and adding new features. We aim to maintain backwards compatibility when possible. Releases and changelog are maintained in the releases page. Please read them when upgrading. 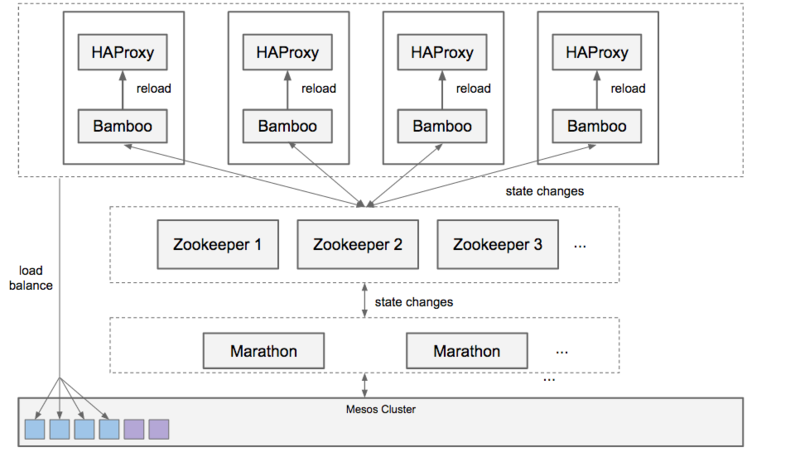 You can deploy Bamboo with HAProxy on each Mesos slave. Each web service being allocated on Mesos Slave can discover services via localhost or domain you assigned by ACL rules. Alternatively, you can deploy Bamboo and HAProxy on separate instances, which means you need to loadbalance HAProxy cluster. UI is useful to manage and visualize current state of proxy rules. Of course, you can configure HAProxy template to load balance Bamboo. Bamboo binary accepts -config option to specify application configuration JSON file location. Type -help to get current available options. // A command that will validate the config before running reload command. In this example, both BAMBOO_TCP_PORT and MY_CUSTOM_ENV can be accessed in HAProxy template. This enables flexible template customization depending on your preferences. The default acl rule in the haproxy_template.cfg uses the full marathon app id, which may include slash-separated groups. For example if your app is named "/mygroup/appname", your default acl will be path_beg -i /mygroup/appname. This can always be changed using the bamboo web UI. There is also a DNS friendly version of your marathon app Id which can be used instead of the slash-separated one. MesosDnsId includes the groups as hyphenated suffixes. For example, if your appname is "/another/group/app" then the MesosDnsId will be "app-group-another". You can edit the haproxy_template.cfg and use the DNS friendly name for your default ACL instead. Configuration in the production.json file can be overridden with environment variables below. This is generally useful when you are building a Docker image for Bamboo and HAProxy. If they are not specified then the values from the configuration file will be used. BAMBOO_DOCKER_AUTO_HOST Sets BAMBOO_ENDPOINT=$HOST when Bamboo container starts. Can be any value. Note: Create semantics are available since version 0.2.11. We recommend installing binary with deb or rpm package. docker build -f Dockerfile-deb -t bamboo-build . Independently how you build the deb package, you can copy it to a server or publish to your own apt repository. Upstart job bamboo-server, e.g. upstart assumes /var/bamboo/production.json is configured correctly. 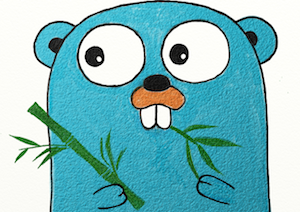 There is a Dockerfile that will allow Bamboo to be built and run from within a Docker container. docker build -t bamboo . Bamboo is started by supervisord in this Docker image. The default Supervisord configuration redirects stderr/stdout logs to the terminal. If you wish to turn the debug information off in production, you can use an alternative configuration. We use godep managing Go package dependencies; Goconvey for unit testing; CommonJS and SASS for frontend development and build distribution.